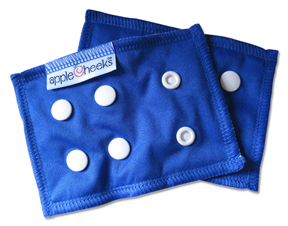 AppleCheeks Waist Extenders allow you to get even more life from your gorgeous AppleCheeks envelope covers. Sold in pairs, simply snap one on each side of your trim fitting diaper cover and, voila, you get up to approximately 2 inches of extra space for baby’s cute rolls! Available in Storm Reborn only. They can be mixed and matched with all envelope covers for ultimate cuteness.